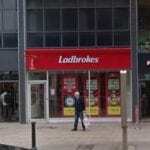 Here you can find all the details you need about Ladbrokes 43 Deansgate Manchester betting shop. 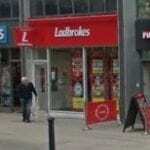 This includes the opening times, location and also local information about the surrounding area. Here you can check where the branch is located on the map and see if it’s near to you if you are planning on making a visit. 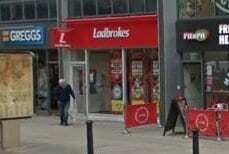 Here you can see some photos of the shop which is located at 43 Deansgate in Manchester. It is close to many other popular shopping locations as well as restaurants and amenities. 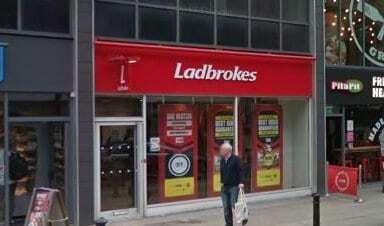 Ladbrokes 43 Deansgate Manchester is open 7 days a week. Below you can see the opening hours for each day of the week. 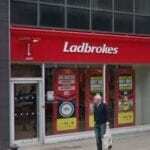 Ladbrokes is a licensed Betting Shop located at 43 Deansgate in MANCHESTER M3 2AY. 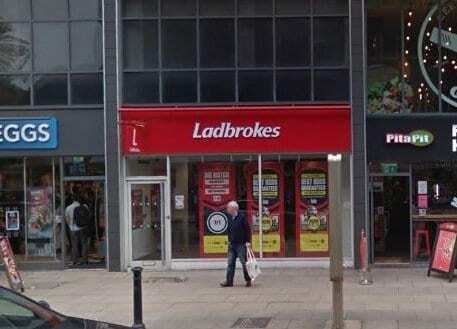 It’s in a great location close to lots of other local amenities so it’s really easy to pay a visit if you’re thinking of betting on sports or having a look at the latest offers. Deansgate is a main road (part of the A56) through Manchester city centre, England. It runs roughly north-south in a near straight route through the western part of the city centre and is the longest road in the city centre at over one mile long. Deansgate is one of the city’s oldest thoroughfares. In Roman times its route passed close to the Roman fort of Mamucium and led from the River Medlock where there was a ford and the road to Deva (Chester). Along its length were several civilian buildings and a mansio in the vicinity of the Hilton Hotel. Part of it was called Aldport Lane from Saxon times. (Aldport was the Saxon name for Castlefield.) Until the 1730s the area was rural but became built up after the development of a quay on the river. The road is named after the lost River Dene, which may have flowed along the Hanging Ditch connecting the River Irk to the River Irwell, at the street’s northern end. (“Gate” derives from the Norse gata, meaning way). By the late 19th century Deansgate was an area of varied uses: its northern end had shopping and substantial office buildings while further south were slums and a working-class area around St John’s Church (St John Street remaining upper middle class). The Wood Street Mission began to address the social problems in 1869 and its work continues in a very different form. From Peter Street southwards the eastern side was dominated by the viaducts of the Great Northern and Manchester South Junction Railways, while the Rochdale Canal crossed below Deansgate to connect with the other waterways beyond. In the late 20th century Deansgate was home to the head office of the Manchester Evening News newspaper, now replaced by part of the Spinningfields development.